In his new book, ‘Standing Tall: Acquiring the 13 Riches of Life Effortlessly’, Best-Selling Author Mark Januszewski shares how a chance meeting led to the Seven Ancient Verities and how they created lasting wealth that took him from being bankrupt in Boston to living beachfront on Kauai, Hawaii. Standing Tall’ provides a roadmap to success, as long as readers are open to understanding and applying the simple principles daily that made me successful. 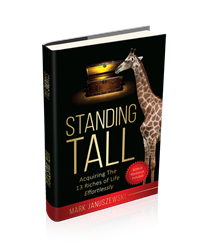 In his new book, ‘Standing Tall: Acquiring the 13 Riches of Life Effortlessly’, Mark Januszewski shares the Seven Ancient Verities along with a workbook that yielded lasting wealth unilaterally. Mastering the Verities and following the worksheets a few minutes a day took Mark from bankrupt to living beachfront on Kauai, Hawaii. Januszewski details the “Seven Ancient Verities” that have been passed down from generation to generation, providing a roadmap to success that has withstood the test of time. Each recipient of the Seven Verities pays forward the wealth that they have manifested for themselves by passing the verities on to another. For over 4000 years, legend has it these Verities come with a Map to the 13 Riches of life. One must learn the verities to understand The Map to Riches. This ancient document, until now, was traditionally passed from one person to another, generation upon generation. These timeless principles were taught to Januszewski by his mentor and now he passes them on to his readers marking the first time in history they have appeared in print. Mark Januszewski famously went from being “bankrupt in Boston to beachfront in Hawaii” after learning the Seven Ancient Verities to success that have been passed down generation upon generation, to people handpicked by those who held the secrets. In his book, ‘Standing Tall: Acquiring the 13 Riches of Life Effortlessly’, he offers those secrets to his readers, making success attainable by anyone. As a six-figure earner in six different industries, Januszewski has won a number of awards and accolades, including Trainer of the Year 1990, 100K Select XanGo, National Supervising Coordinator for Market America, Top Pin Level MBC, #1 Sales in #1 District Britannica, and #1 Sales for Mutual of New York regionally. As well as running his own successful multi-million dollar seafood retailing business. Now is his 7th six figure venture Mark is also the founder of The World’s Laziest Networker, which offers business people free tips, sound business principles and skills for successful networking. He is the creator of the Master Key Mastermind Alliance, a six-month course offering lessons taught to Januszewski by Napoleon Hill’s best friend, and Go90Grow, an online course for networking and sales professionals. Mark and his team also host annual Live Events on the island of Kauai. Every year 100s of folks from all over the planet, 17 different countries in 2106, will be attending their live events. Beyond Publishing - Launching Authors - Building PlatformsLos Angeles based Beyond Publishing is a Full Service Author Launch Platform helping Writers get their Book to the World!